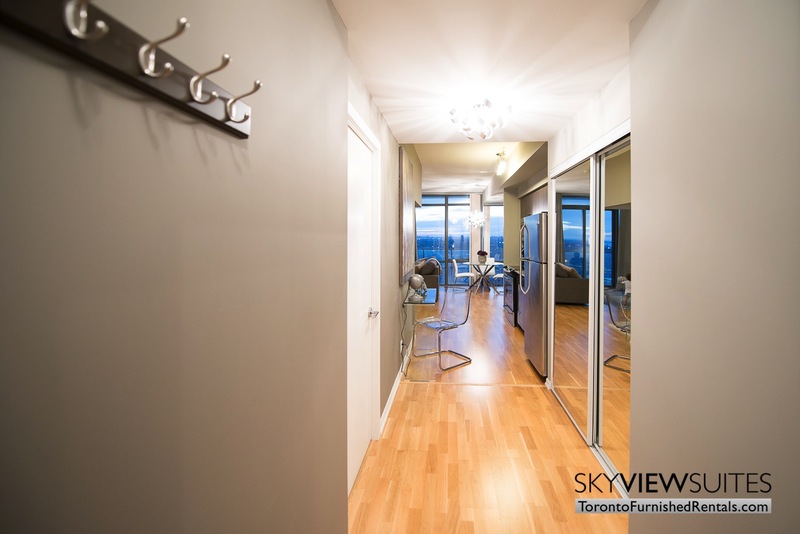 Welcome to Sky View Suites Burano C Toronto furnished apartment in downtown Toronto. 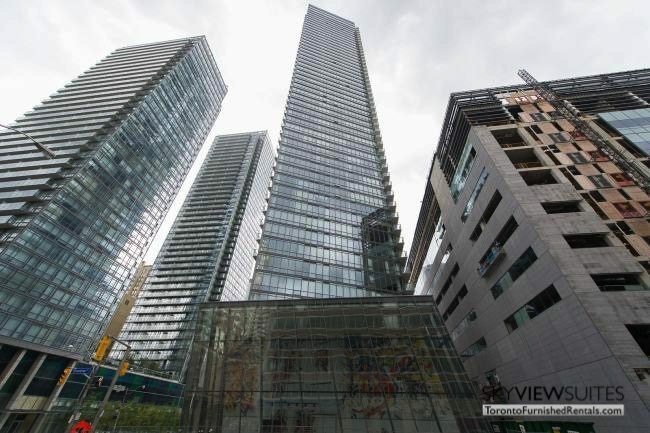 This spacious 1 bedroom suite is located in one of the most desired neighbourhoods in Toronto along the Bay St. corridor. With stunning views of the city below, floor to ceiling windows and a modern open floor plan, this suite is sure to impress any guest during their extended stay. 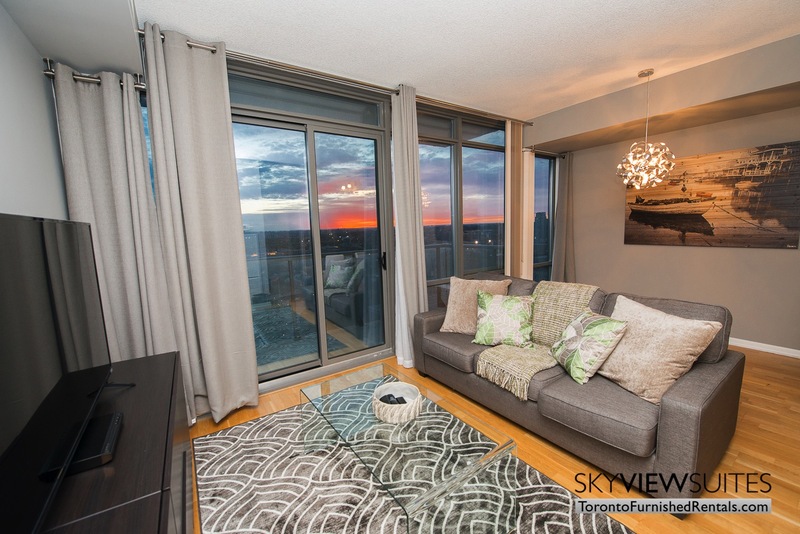 Walk down the foyer and step foot into the spacious living area of this apartment. 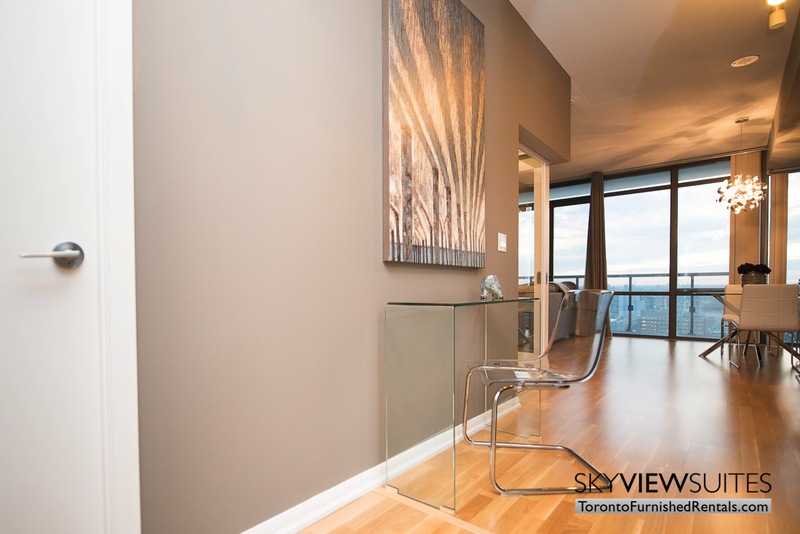 You will first see the beautiful kitchen placed against the sprawling right wall of this Toronto furnished living suite. This kitchen features full sized stainless steel appliances, speckled granite counters and dark brown cabinets. 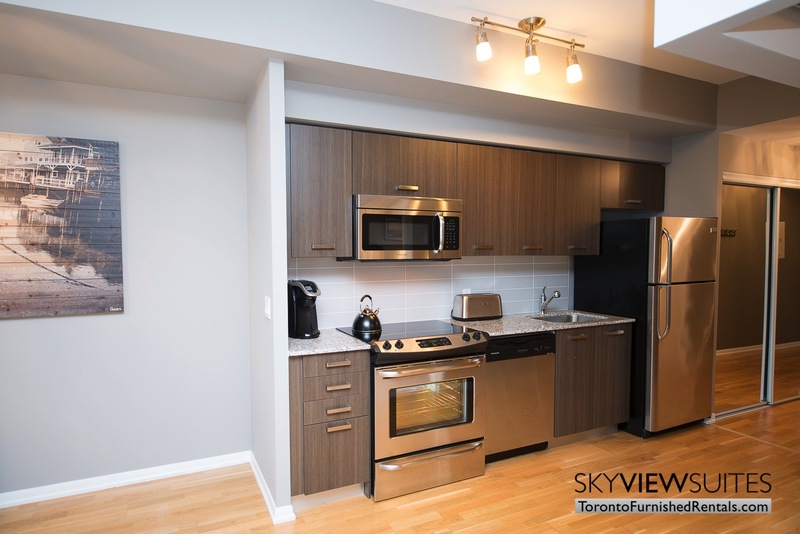 Not only does Sky View Suites provide kitchen essentials such as cutlery, plates and glassware but they also provide extras like kettles, Keurig coffee makers and much more. Having a fully stocked kitchen eliminates the need to eat out for every meal, like you would if you were staying in a hotel. Just adjacent to the kitchen is the main living space, complete with a small dining area for guests to use. This dining area features a contemporary glass table that has seating for 3 and is the perfect spot to enjoy a meal. Guests looking to kick back and relax after a long day don’t need to look any further than the plush grey couch that comes with this unit. This couch also doubles as a queen sized bed when pulled out. This comfortable room is completed with a sleek glass coffee table, flat screen TV and entertainment unit and floor to ceiling drapes for optimal privacy. Directly off the main living space guests will find the inviting private bedroom. This tranquil space comes ready to go with an inviting queen sized bed that is prepared with all the necessary sheets, linens and pillows one might need. Close the sliding doors to keep sound in or open them to have the bedroom open to the main living area. Although this room does not have a window, the glass doors allow for optimal light flow and give the space an airy feel. Here guests will find everything they need including a shower/bath combo and a vanity sink with plenty of storage beneath it. 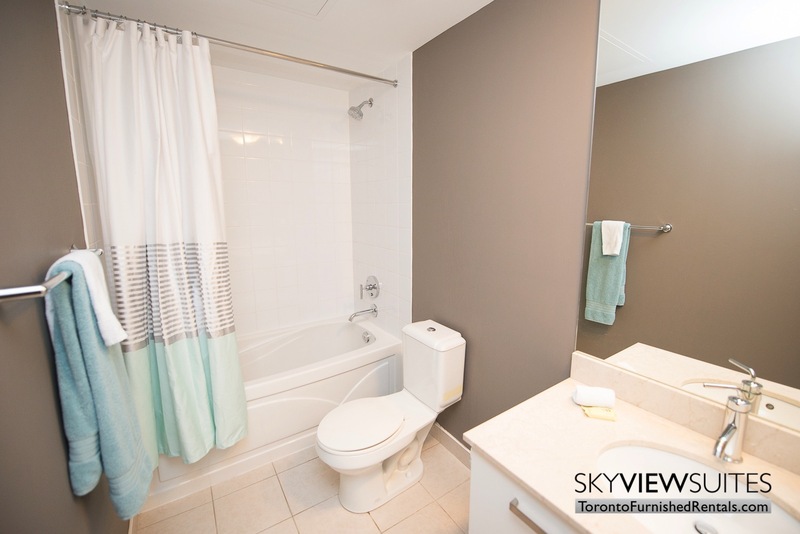 Towels for the bathroom are also provided by Sky View Suites, to ensure a hassle free stay in your short-term rental. 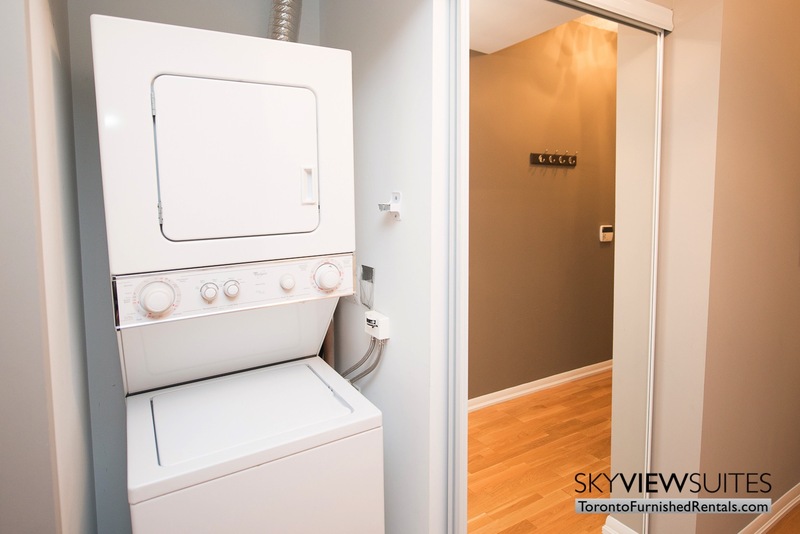 If you love the sound of this unit and area, but are looking for a little more space check out our Burano 2 bedroom unit in the same building. 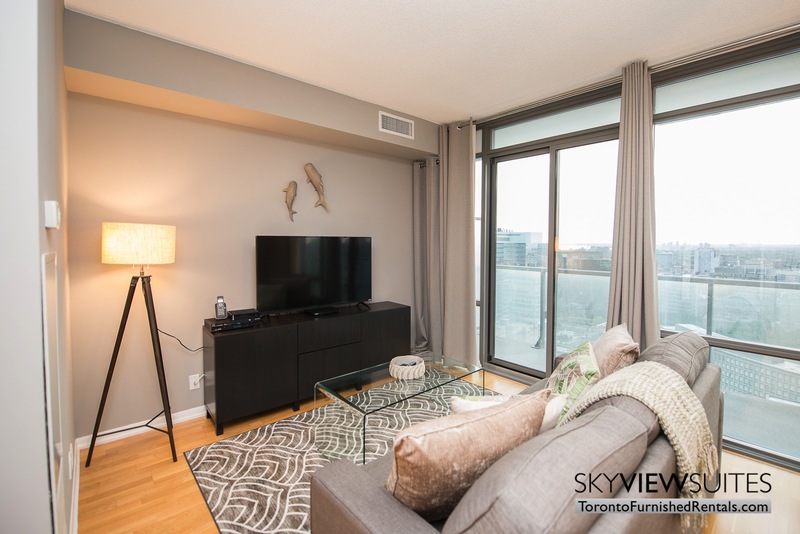 Guests of this Toronto furnished unit will find themselves in Toronto’s bustling Bay St. corridor, an area known for its proximity to two of Toronto’s Universities Toronto’s hospital district as well as great entertainment, shopping and public transportation. 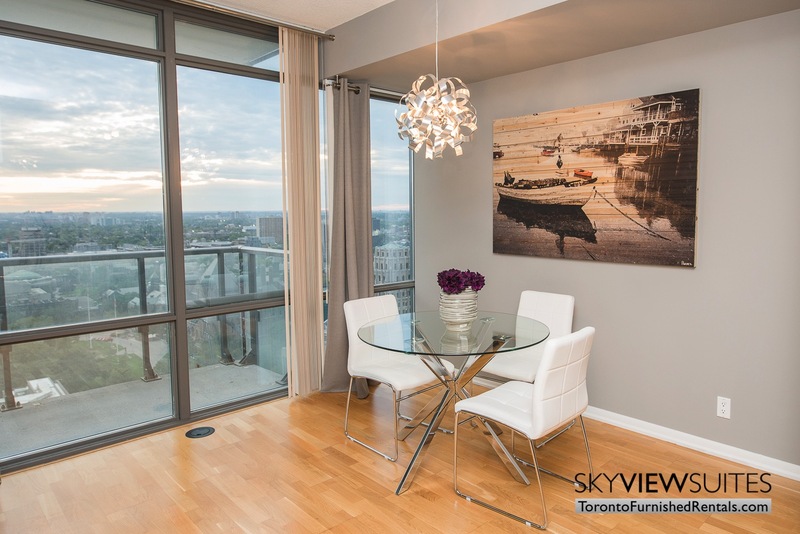 Essentials like groceries and pharmacies are a mere minutes walk down Bay Street for guests of Burano C.
This suite is also in the perfect location to visit one of Toronto’s busiest hubs of entertainment, Yonge-Dundas Square. Think of this bustling intersection, as Toronto’s own Times Square. The lights, the action and the entertainment in this area is unmatched anywhere else in the city. The square is an open, public space that often hosts events and gatherings of all sizes year round. 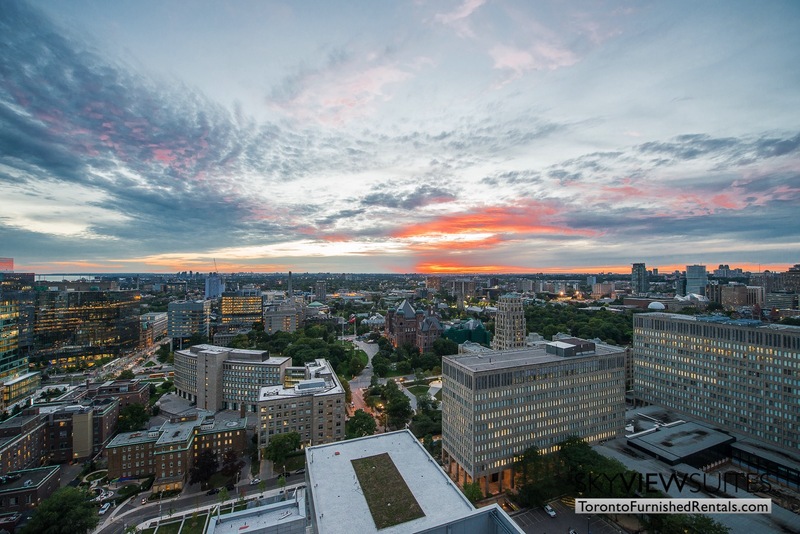 Be sure to check the event calendar to see what is going on during your stay. The Burano building that hosts a few of our extended stay apartments is modelled after the sculptures and paintings in the city of Burano Italy. The sheer size of this building is masked by its elegant design as Burano stands almost 50 stories tall. It’s beautiful brick base an extremely unique glass design is not seen in most modern condominiums. 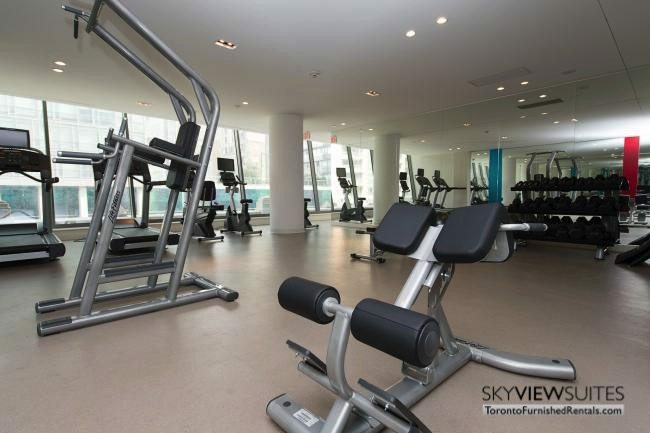 Guests of our Toronto furnished short term rentals can use the recreational facilities, including a theatre room, an internet lounge, a gym, and party room with service kitchen. Burano also has 24 hour security service.